There are several problems with outsourcing your work. Missing out on the nuances of language is one of them. Nobody must've explained to the poor Flash novice in India about the 'loan shark'. Emboldened by the amount of creative control given to him by his American overlords ("Just put whatever animal/bird/fish you want in the ad, son! "), Sanjay decides on the awesomest of all sea creatures to represent LMB -- the shark. We see the ironic result of his brainstorm: little goldfish states swallowed up by the killer that is LMB. The uneasy silence that lingered in LMB's corridors following the creation of an almost sensible ad had to be broken. LMB's ad developers screwed their thinking electrodes back on and came up with this zinger. No more could they be accused of slacking off on their jobs. This one has all the trademarks of LMB: The dubious humor value, the abuse of colors and a surprised looking animal. In a scene vaguely remniscient of North by Northwest, a fleeing bird is bombarded with huge drops of rain. If only they had made this more interactive, by making the bird move along with the cursor so you had to escape the drops... nay, that's just wishful thinking. LMB's designers strive to lower the bar on banner ads, not raise them. This is about as normal as an LMB ad could get. What are they selling? Mortgages. Is that fact mentioned prominently on the ad? Check. What are they selling mortgages for? Homes. Behold, a house looms majestically in a corner. 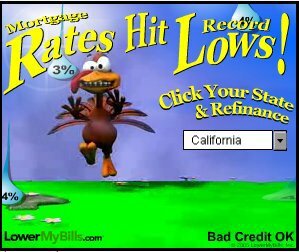 Are they selling mortgages on homes for good rates in all states? Yes again. A list of the 51 states is presented, lest we forget. If all LMB ads were as boring as this, this blog wouldn't exist, would it? Reminding us of sunnier times, the coconut tree gently sways in the breeze. Never mind the ugly red bricks covering its stem. Suddenly, a brisk gust whips the tree. The coconuts - two 7%'s, one 4% and one 5% - drop to the ground; mortgages are falling! A few moments after this, defying all known laws of gravity, the coconuts magically float back up and re-attach themselves to the tree. The cycle begins again, and the tree tries in vain to get rid of the coconuts that are a bit too fond of their origin.